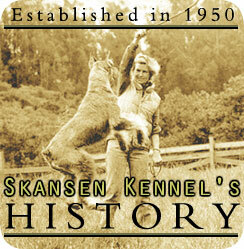 Skansen Kennel was founded in Sweden in 1950 by Sylvia Hammarstrom, then moved to Sebastopol, California in 1964, where Syliva has been continuously breeding top show, family, pet and companion Schnauzers, located on a 100 acre ranch one hour North of San Francisco in Sonoma County. 45 years of experience breeding, showing and judging Schnauzers has brought Skansen Kennel attention from the whole world. We have bred over 900 Giant Schnauzer Champions, in itself a record and our dogs have won many hundreds of Best in Shows in the USA, Canada, Mexico, Europe, Africa, South America and Japan. To keep this high quality, we not only export our dogs to top kennels all over the world - but bring in top stud dogs regularly, like Ch. Lillemarkes Kobuch from Denmark, Ch. Lucas de Campos de Oro from Spain, Ch. Quo Vadis V.D. Havenstad from Belgium, etc. The dogs live in big, open 1/2 acre fields two or three dogs together, so they can play and run all day, as we really believe in lots of exercise, sunshine and good nutrition. There are 30 - 40 adult Giants, 10 Standards and 10 Minis - most are Champions. The dogs are very well socialized with many visitors, as well as the 8 people who groom, exercise, feed and clean them. Good sound temperaments are most important in our breeding program as well as good health. No skin problems, hip dysplasia or other health problems are tolerated. Most important to us is that our dogs all get a good home, so our dogs are never sold in pet stores, you have to come here or we will ship you a puppy. To help you choose, we will send a 1 1/2 hour audio and 10 pages of information, with a list of pups available and pictures of sires, for free, as well as a loaner video showing the Schnauzers on the ranch (on request). Each puppy buyer gets 2 videos, 3 more audio tapes and 2 books to help them raise a good, healthy companion and we are always available to answer any questions 7 days a week.